The US remained the largest importer of Vietnamese pepper in the reviewed period, with 2,697 tonnes worth 12.3 million USD, accounting for 15.7 percent and 17.8 percent in volume and value of the country's pepper exports. Other markets witnessing the strongest surges in pepper import turnover from Vietnam were India (140 percent), Kuwait (up 104 percent) Pakistan (101 percent), and Thailand (84.9 percent). However, the export price of pepper went down at almost export markets of Vietnam compared to the same period last year. The biggest fall was reported in the Pakistan market, dropping by 50 percent to 3,534 USD per tonne. Meanwhile, the highest export price was seen in the Australian market, reaching 6,318 USD per tonne. 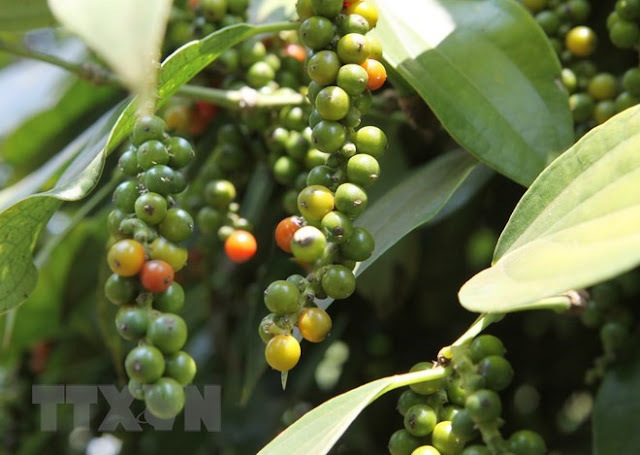 Vietnam's pepper industry is forecast to continue facing difficulties in 2018 as the supply is increasing beyond demand, and because of technical barriers applied by importers such as the US and the European Union. Vietnamese pepper products have been exported to 100 countries and territories, with Asia, Europe and the US being the biggest markets.-VNA. Illustrative image (Source: VNA) Hanoi (VNA).